The newly turned 18 year old singer received his birthday gift while appearing on the Ellen DeGeneres Show. Bieber was given the car by his manager Scooter Braun, who said: "You work really really hard," I always yell at you, 'Don't get anything flashy!' You know, we're not about that. Be humble, be humble. And I kind of broke my own rule." Braun went on to say: "We wanted to make sure, since you love cars, that when you're on the road you are always environmentally friendly. And we decided to get you a car that would make you stand out … I think you know where I'm going, and you're kind of freaking out right now. That's a Fisker Karma." Braun certainly achived his goal if he wanted to get Bieber an environmentally friendly car that stands out. The Fisker Karma is the first electric vehicle to not compromise looks in its quest for efficiency. It is the first true electric luxury extended range vehicle able to plug in or fill up. The Fisker Karma allows drivers to switch between the all-electric Stealth Mode and fuel assisted Sport Mode with an easy paddle shift. The Karma also features exclusive technology like the Fisker-patented EVer, which uses an electric generator and battery pack to power the vehicle’s duel electric motors. The luxury EV also comes eqipped with regenerative braking, a system that harnesses kinetic energy while accelerating and feeds it back into the battery. The Karma gets an EPA estimated 52-mpg-e, 32-mpg all-electric range and 20-mpg gasoline. Suffice to say, Bieber got a truly unique birthday gift, but is he the first high profile celebrity to stake claim to the 2012 Fisker Karma? The answer is no, because the very first Fisker Karma was delivered to actor Leonardo DiCaprio in July 2011. The next two high profile celebrities to get the keys to the Karma were former Vice President Al Gore and former Secretary of State Colin Powell. 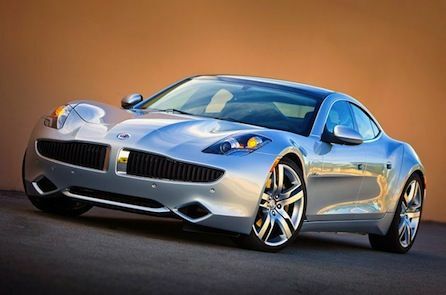 Fisker received another celebrity endorsement in September 2011, when the 2012 Karma appeared on the hit CBS sitcom Two and a Half Men. The EV was featured throughout the show’s ninth season as the personal car of Walden Schmidt, played by Ashton Kutcher. Despite the numerous celebrity endorsements, Fisker Automotive has faced multiple setbacks. In December 2011, the 2012 Fisker Karma was recalled because of possible fire risks, due to the vehicle’s high-voltage battery. Additionally, Fisker has lowered their 2012 sales expectations from 15,000 to 10,000 units. Either way, Bieber is probably ecstatic to say he’s the owner of his new $116,000 birthday gift and Fisker Automotive likely feels the same way in receiving another high profile supporter.